When I first heard that there was a new Restaurant opening called “The Armadillo Grill,” I will admit that I was having doubts. I suppose the reasoning behind that is because I have been hoping that since Blairsville is now able to serve alcohol, that we would get some popular food chains’ restaurants, but instead we get another locally owned place with a name that makes you suspicious of what they serve. However, I stand corrected. 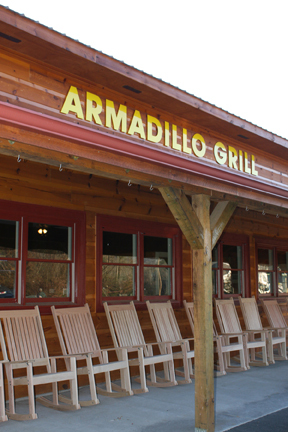 Eating at “The Armadillo Grill” was actually a very satisfying dining experience. When I first pulled up to the restaurant, I was not extremely impressed due to the lack of parking options and landscaping; although I am willing to forgive that, acknowledging that they are brand new and are no doubt still making important decisions. It should be noted that the place was packed, cars parked in the adjacent field, and many groups of people waiting to be seated. Upon entering the establishment I thought it had an altogether pleasant atmosphere. Multiple pieces of local art adorned the walls, which are painted a dark red contrasted with natural wood trim, and dim lights hover over the well-spaced tables and booths that are all centered around a rustic fireplace. About 25 minutes passed before I was seated, and I thought the service was great. Our waitress was polite and well-spoken and ensured that our glasses remained full and our table clear of dirty dishes. The food came out surprisingly fast considering how they busy they were at the time. The menu consisted of a large variety of items including seafood, pastas, burgers, steaks and an assortment of selections with a southern flare, and some that were refreshingly unique. I indulged in the “Pecos chicken Parm” which consisted of a large flour tortilla shell full of penne pasta with Alfredo sauce topped with three large portions of fried chicken and provolone cheese, served with an assortment of other spices that made for a delicious and filling meal at a decent price of $11.99. Altogether, I had a very enjoyable experience and left full and content. The “Armadillo Grill” appears to have a bright future ahead of itself, and based on my personal dining experience I give it an A and look forward to going again soon.